Fly fishing adventure vacations for wild native trout and salmon in the Caribou Mountains of British Columbia, Canada with Pyna-tee-ah Lodge and Adventures. World class flyfishing for legendary wild native trout and salmon on gold medal wilderness rivers, streams and lakes in British Columbia, Canada - the #1 trout fishing destination in BC! Pyna-tee-ah Fishing Adventures is a professional angling guide service and lodge specializing in quality wilderness fly-fishing adventures. Flyfish BC with Pyna-tee-ah's licenced professional guides, with over 25 years experience in the flyfishing and outdoor adventure tourism industry. 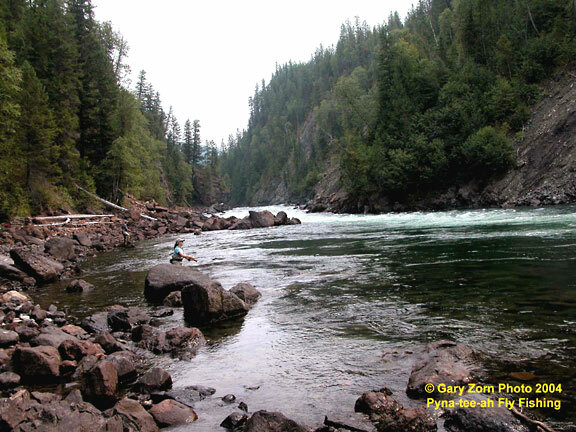 Pyna-tee-ah offers fully guided trips in 2 Provincial Parks and on the many blue ribbon rivers, lakes and streams of the Quesnel Lake watershed in the Caribou Mountains. The Quesnel Lake watershed annually hosts the largest wild salmon run in the province. Originating high in the Cariboo Mountains, the uncrowded waters , pure and gin clear, range from shallow rocky streams to rivers with big deep pools just waiting for you to present your fly to the robust wild trout. This fishery ranks highly among the hallowed flyfishing waters of the world. No matter the fly fishing season, spring, summer or fall, the dry fly, streamer and nymph fishing ranks among the best in the world. Fall flyfishing during the salmon runs adds a unique dimension to the flyfishing season as we go after monster 'bows and Dolly Varden with nymphs, egg patterns and flesh flies. 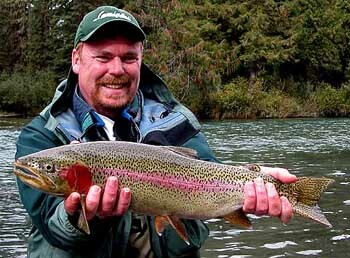 The Quesnel Lake fishery is known for it's big wild rainbows. The coloration of these beautiful, healthy rainbow trout rivals the northern lights frequently seen in our night skies. Trout average 2 to 10 pounds. However, this phenomenal freshwater fishery is home to a very unique, genetically pure strain of large slow growing trout that produce trophy catches in double digit pounds up to 20+. Known for spectacular scenery, wildlife, worl	d class fly fishing for wild native Rainbows, Dolly Varden, bull trout, salmon, kokanee, and char in uncrowded waters, the area is located about 260 air miles northeast of Vancouver in the Caribou Mountains. There are daily flights from Vancouver to Williams Lake, an hour's drive from the fishery and our base in Likely. If you have the time to drive from Vancouver or Whistler you will be awed by the spectacular mountain scenery of the Fraser River Canyon. Driving time from Vancouver is about 8 hours and from Whistler through the coast mountains and the interior plateau it is about 6 hours. The rivers and streams of the region radiate around Quesnel Lake, the epicenter of the watershed. Quesnel Lake, formed by glaciers during the ice age, is the deepest fjord lake on earth at over 2000 feet in depth with over 360 miles of shoreline and an overall length of 80 miles. Besides exquisite wilderness river fishing, Quesnel Lake and the multitude of smaller surrounding waters offers a fabulous stillwater fishery from early spring onward with opportunity to catch trophy'bows using fry patterns, nymphs, dry flies, caddis, and our own unique flies and techniques. We cater to fly fishers of all skill levels and abilities, novice to expert. Pyna-tee-ah's professional patient and caring staff freely share their knowledge and experience with you to ensure you have the sportfishing vacation of a lifetime. Our programs include specialty features such as fly tying, women's flyfishing programs, casting instruction and gear and fly selection, ecotours and wildlife viewing. As for world class flyfishing - we've got it!! River fishing, wading, drift fishing, lake fishing, stillwater, trophy rainbow, dolly varden or bull	trout, salmon, kokanee and char, our fishery is outstanding. Flyfish BC's #1 flyfishing destination. Share a memorable wilderness flyfishing adventure for trophy trout with us in British Columbia, Kanada. "Pyna-tee-ah Fishing Adventures offers one of the most unique fly-fishing experiences found anywhere on the planet. The only thing you will be short on is time." Gary and Peggy Zorn take great pride in assuring everyone has a trip of a lifetime. Packages include everything from guiding world class fishing, to meals and lodging at reasonable rates. Featured on TV and many magazines Pyna-tee-ah Fishing Adventures is truly world class fly-fishing. All-inclusive packages - guided river fishing, custom back country fishing adventures. Trophy Rainbow Trout, Lake Trout and Dolly Varden up to 30 lbs. await you. Through years of experience in this fishery Pyna-tee-ah has developed their own unique and highly successful fishing methods, techniques and flies. Located 250 air miles northeast of Vancouver in central British Columbia, Canada, on pristine Quesnel Lake. We cater to both the serious fly fisher and the novice. Fishing and outdoor adventures with a variety of activities in one of the world's most spectacular regions of Super Natural BC, including four major parks, this area provides world class outdoor adventure that is truly one of a kind.